JGarden Description: Located in a public park, between the beaches of Larvotto and the Palace of the Congresses (Grimaldi Forum). A voir aussi, le jardin japonais du nouveau Sporting d'ete: accessible aux clients du restaurant-discoteque. Of refined beauty, this new garden planted in the heart of the Principality was designed, at the request of H.S.H. Prince Rainier III, by the landscape architect Yasuo Beppu, Winner of the Flower Exhibition of Osaka�90. Mr Beppu has created here a veritable work of art which honours the strictest principles stemmed from a secular tradition. Originating from China, the concept of a Japanese Garden goes back to the 6th century. It is based on three fundamental elements : the line, the point and the surface, illustrated here by a long path circumventing a large lake and a waterfall. The Japanese Garden is a stylized copy of Nature and incorporates all its elements : mountains, hills, waterfalls, beaches, streams, lakes�The concept of compactness comes from the Zen philosophy which advocates Meditation as a way of seeking beauty and serenity. Structured in an asymmetrical and near-natural way, this garden has taken more than 17 months to create. Since the great Shintoist priest of the Dazaifu Temple, in Fukuoka, on 25th November 1992, blessed the chosen site on the shores of the Mediterranean, within a short distance from the Grimaldi Forum Monaco, every possible care has been given to this garden to enable the visitors to enjoy all the multiple facets of the Japanese landscape. Each element in this garden has been considered in minute detail to guide the visitor towards an inner world. The Wall (He�): Its line has been broken by bamboo fencing to soften the visual rhythm. Heightened by a row of parasol pine-trees, as protection from the sea-winds, it is adorned uphill, with soft pink-flowering cherry trees of delicate beauty. The Main Gate (Sh�-mon) is built in the proximity of the Grimaldi Forum Monaco. Its imposing proportions are a sign of respect towards the visitor. The Stone Lanterns (T�r�) of particular beauty have been placed in parts of the garden of special interest and all present different characteristics : crowned with a sphere which reflects the fire dedicated to the God who will grant a wish (Kasuga), or sculptured with lotus flower petals (Yunoki) ; others are typified by a very large roof (Yukimi), or have thirteen storeys (Tas�-t�) ; others can be admired at the entrance to the Tea House (Riky�), and in the lake (Mizu-hotaru). The Lake (Ik�): With its slightly-slanting pebble beach, this vast smooth mirror shimmers in the heart of the garden. The Stone Fountain (Fusen-Ishi) flows towards the lake as if to wish the Principality long prosperity. The Covered Terrace (Kyuke�jo): with its copper roof and partly overlooking the lake according to a tradition which dates back to the 12th century, largely opens out onto the Mediterranean Sea. The Bamboo Fencing (Tak�gaki) represents simplicity, lightness and fragility for, according to the Japanese philosophy, although it marks a boundary, it is nevertheless a welcoming sight. the tortoise, round and slow, which is setting out on a long journey to the seven oceans is represented by the island with two pine trees. the crane, tall and fast, which makes its nest to sit on its eggs and thrive, is represented by the second island with only one pine tree. The gate of the Tea House (Cha-mon) opens onto a path (Rojo) intentionally created for walking with little steps, a veritable cleansing path. (Note : a fossil on the stone to the left). 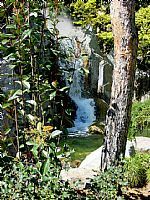 It leads to five water stones (Tsukuba�) where the visitor is invited to purify both mind and body with a ladle of water, before entering the Tea House.